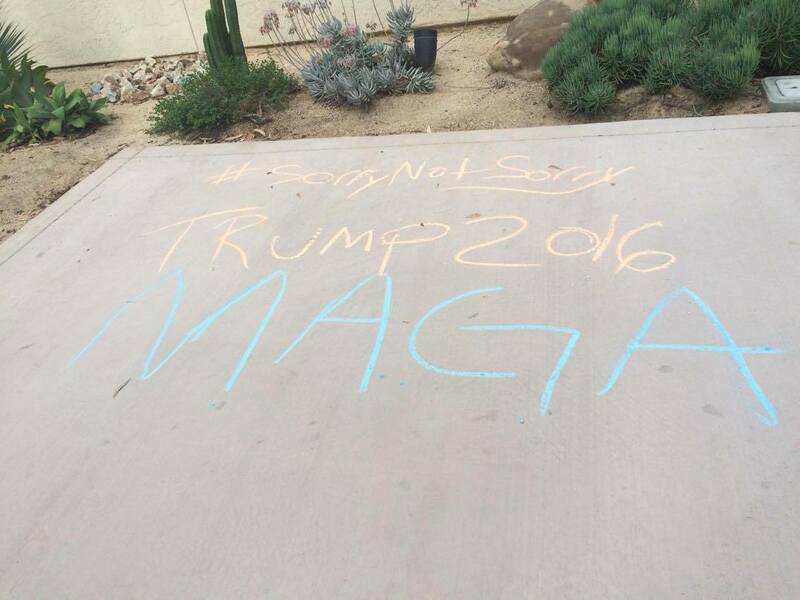 Five unidentified hooded white males vandalized UCSD with chalk statements supporting Republican presidential candidate Donald Trump and his anti-immigrant policies on April 8, CBS 8 reported. The messages — which included “TRITONS 4 TRUMP” and “BUILD THE WALL, DEPORT THEM ALL” — were written on Library Walk and the sidewalks near the Raza Resource Centro. Furthermore, more pro-Trump statements were found written in chalk outside Peterson Hall on the morning of April 14. The chalk has since been removed. UCSD’s Chancellor, Executive Vice Chancellor and Vice Chancellors released a joint statement following the first incident in which they deemed the content of the statements reflective of America’s “divisive political climate” and contrary to the university’s Principles of Community. Eleanor Roosevelt College Provost Ivan Evans condemned the statement a day earlier in a Facebook post for targeting “Mexico and Latino/a students” and called upon the campus community to not give the culprits credibility. Senior Advocate for the A.S. Office of Student Advocacy Randon Herrera told the UCSD Guardian that the actions could constitute several student conduct code violations. These include, “conduct that threatens health or safety of any person” (VII.H), “verbal, written, electronic, or other threats of violence” (VII.I), and “conduct (e.g. harassment) that is so severe and/or pervasive, and objectively offensive, and that so substantially impairs a person’s access to University programs or activities that the person is effectively denied equal access to the University’s resources and opportunities” (VII.J). Perhaps the editorial board should pick up a copy of the California Penal Code and review what constitutes vandalism. We live in a nation of sissies. When the stuff they wrote constitutes a “threats of violence” you know we are doomed. https://www.washingtonpost.com/news/volokh-conspiracy/wp/2016/04/12/uc-san-diego-provost-expects-the-fullest-sanctions-for-pro-trump-anti-illegal-alien-sidewalk-chalking/ Randon Herrera is not an attorney. UCSD policy expressly provides that chalking is permitted “on sidewalks of the university grounds that are exposed to weather elements and not covered by a roof or overhang.” This article should reflect actual university policy, not just a student representative’s understanding (or lack thereof) of the law. Chalking on the ground doesn’t fall into ANY of those categories. True, in a court of law their actions would likely be protected. But UCSD is not a court of law and lawyers have nothing to do with the way they sanction students. Please !!!! I’m an immigrant. My entire family entered legally, obeyed laws, and learned English. People who violate US immigration laws are migrants, not immigrants. Many (or most) immigrants ho obeyed our laws support Mr. Trump.